This eye serum instantly increases elasticity of the skin, smoothing lines and wrinkles around eyes. The serum tightens skin under the eyes and lifts sagging eyebrows and eyelids. Your skin texture will feel silky-young and smooth. Directions: Apply around the eyes. A little of this highly-concentrated serum goes a long way. Massage gently until absorbed. Use morning and evening. Day cream Booster pro based on extraordinary formula that Collagen and Hyaluronic Acid that slows down the process of skin aging, firms and tightens the skin and helps maintain its elasticity. The cream penetrates deeply and helps in producing collagen for reducing wrinkles and for skin texture improving. A mixture of vitamin E and C protects the skin from harmful free radicals (toxins).• From the very first use you will note an improvement in the texture and elasticity of your skin.• After a month's use your skin will look firmer and more radiant. Anti Ageing & Skin calming Nourishes skin overnight with premium anti-ageing oils and Retinol (Vitamin A) to keep skin soft, smooth and young-looking. Natural oils and plant extracts instantly penetrate dry skin, restoring its balance of moisture. Ideal for nightly use.Directions: Apply the cream nightly to clean and dry face and neck. Massage gently till absorbed. Booster Pro Collagen Mask is rich with high level of Hydrolyzed Collagen, Ginkgo Biloba leaf and prime seed oils that tightens the skin and offers intensive moisturizing and anti-oxidizing treatment. By applying the mask your skin looks young and glowing. • From the very first use you will note an improvement in the texture and elasticity of your skin.• After a month's use your skin will look firmer and more radiant. A unique formula that provides deep cleaning of the facial skin without harming the skin's elasticity and natural moisture levels. The cleanser combines peach grains and retinol to remove dead skin cells and create smooth skin with unified texture. Chamomile and aloe vera extracts calm the skin and impart it with radiance and vitality.• From the very first use you will note an improvement in the skin's texture and a feeling of vitality.• After a month's use your skin will look smoother and more radiant. Thanks to the unique BOOSTER Pro technology, the new generation ingredient SYN-COLL, along with vitamins A, C, and E provide constant rejuvenation to your skin, making it firm and smooth. The exclusive complex increases the natural production of collagen in the skin and stimulates the production of new skin cells, thus granting your skin a younger and firmer appearance. The high concentration of hyaluronic acid in the product, combined with elastin, makes the skin feel more vital than ever.• From the very first use you will note an improvement in the texture and elasticity of your skin.• After a month's use your skin will look firmer and more radiant. A unique foaming gel that cleanses and moisturizes the face skin. Enriched with retinol, aloe vera, jojaba oil that help maintain healthy moisture levels in the skin, promote soothing and healing of irritated or damaged skin tissue and protect the skin against pollutants. Also enriched with natural antioxidant Vitamin C that gives the skin a radiant look and Camomile extract that softens the skin. Immediate results mask designed to support your skin, returning it to its more youthful appearance. The unique formulation incorporates peptides and collagen, nutritive proteins rich in amino-acids providing essential contribution to skin moisture level, demonstrating a superior performance in enhancing skin softness and smoothness. Fortified with Elastin and Basil Leaf Extract delivering skin rejuvenating properties, Green Tea Extract for skin soothing effect, Ginkgo Biloba Leaf Extract for a strong boost of hydration, and Vitamin E antioxidant protection from the harmful effect of free radicals. Your skin looks plumped and beautiful.• The first days of using the product – the skin feels softer and smoother instantly. Restoring the skin's natural radiance.• After use of at least a month – The lines are smoother and the skin feels firm and tight. Eyelift Mask Booster Pro - Intensive Skin Firmer & Anti WrinkleImmediate results mask designed to support your eye skin area, returning it to its more youthful appearance. The unique formulation incorporates pearl powder complex, retinol and glycolic acid, utritive proteins rich in amino-acids providing essential contribution to eye skin area moisture level, demonstrating a superior performance in enhancing skin softness and smoothness. Fortified with Evening Primrose Oil and glycol Acid delivering skin rejuvenating properties, Shea butter & Olive oil Extract for skin soothing effect and for a strong boost of hydration.• The first days of using the product – skin feels softer and smoother instantly.• After use of at least a month – The lines are smoother skin feels firm and dark circles are illuminated. Eyelift Booster Pro - Anti wrinkle and dark circle reducerA concentrated cream with a unique formula, containing Hyaluronic acid, Azelaic acid, Collagen, Elastin, Retinol and Amino acids, which act directly on dark circles and wrinkles around the eyes area. This unique formula provides deep nourishment for the skin, the lines are smoother and skin feels firm and tight• The first days of using the product – skin feels softer and smoother instantly.• After use of at least a month – The lines are smoother skin feels firm and dark circles are illuminated. 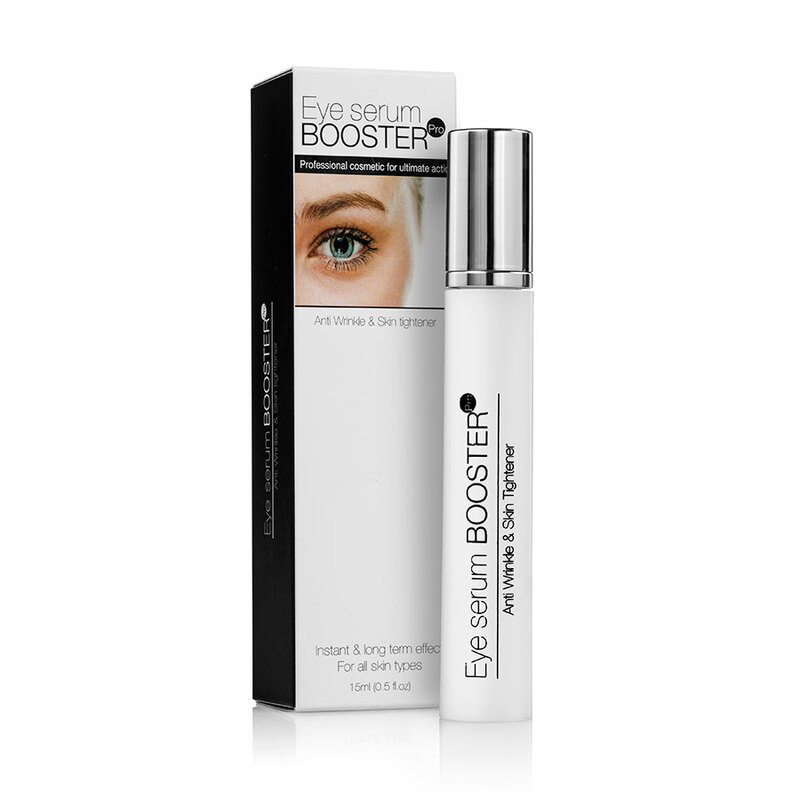 Eye Serum Booster Pro - Anti Wrinkle & Skin TightenerAnti Wrinkle & Skin tightenerThis eye serum instantly increases elasticity of the skin, smoothing lines and wrinkles around eyes. The serum tightens skin under the eyes and lifts sagging eyebrows and eyelids. Your skin texture will feel silky-young and smooth. Directions: Apply around the eyes. A little of this highly-concentrated serum goes a long way. Massage gently until absorbed. Use morning and evening. A concentrated cream with a unique formula, containing Hyaluronic acid, Azelaic acid, Collagen, Elastin, Retinol and Amino acids, which act directly on dark circles and wrinkles around the eyes area. This unique formula provides deep nourishment for the skin, the lines are smoother and skin feels firm and tight• The first days of using the product – skin feels softer and smoother instantly.• After use of at least a month – The lines are smoother skin feels firm and dark circles are illuminated. Booster Pro Premium skin toner removes excess facial oil, dirt and impurities from the skin and clears clogged skin pores. Specially formulated with Aloe vera leaf, plant extracts and age-defying ingredients. This toner reduces fine wrinkles and protects your skin from premature ageing by stimulating cell metabolism. Use daily for a youthful and radiant complexion. Skin refiner & Age CorrectorInstant & long term effect For all skin types30 gr (1oz)The newest serum of BOOSTER Pro brings to your skin innovate complex ingredients that include active minerals, plant extracts, vitamins E&C, Retinol, Peptide and powerful antioxidants which support your collagen level and uplifts your skin cells, giving it an energetic glowing look while encouraging renewal cells production .Fast absorbing of the serum to deep layers will rejuvenate your skin and smooth the wrinkles. Directions: Apply homogeneously to the face and neck. Wait a few minutes before applying cream or any other product. Use daily. A rich cream with a unique formula, which combines a high level of Hyaluronic acid, amino acids, Algisium C, retinol, DSBC and vitamins that gives the skin deep nourishment and tightness with a smoother look. The unique formula helps in producing collagen, which improves the tonus of the skin and reduces the appearance of wrinkles and lines.• The first days of using the product – the skin feels softer and smoother instantly. Restoring the skin's natural radiance.• After use of at least a month – The lines are smoother and the skin feels firm and tight. Immediate results mask designed to support your eye skin area, returning it to its more youthful appearance. The unique formulation incorporates pearl powder complex, retinol and glycolic acid, utritive proteins rich in amino-acids providing essential contribution to eye skin area moisture level, demonstrating a superior performance in enhancing skin softness and smoothness. Fortified with Evening Primrose Oil and glycol Acid delivering skin rejuvenating properties, Shea butter & Olive oil Extract for skin soothing effect and for a strong boost of hydration.• The first days of using the product – skin feels softer and smoother instantly.• After use of at least a month – The lines are smoother skin feels firm and dark circles are illuminated. This newly developed thick and creamy mask with self-heating properties helps open pores and extract impurities. It effectively corrects the first signs of ageing and gives your skin a clean, healthy glow. This mask is composed of a unique combination of Elastin ,powerful prime of Borage Seed oil and plant extracts and is enriched with antioxidant Vitamins C, E & A (Dunaliella Seaweed) that help prevent dehydration and premature skin ageing. For noticeably younger, revitalized and more refined looking skin, we’ve added Omega 3 that effectively restores youth, softness and elasticity to the skin. • From the very first use you will note an improvement in the texture and elasticity of your skin.• After a month's use your skin will look firmer and more radiant.